The emphasis on Bristol, mentioned four times in this short passage, particularly the angry satisfaction with which Bristol is substituted for Bath, implies that Bristol had unsavory connections. As indeed it did. Bristol, the home of Mrs. Elton and her brother-in-law, was one of the three major centers of the slave trade. From Bristol, London, and Liverpool, ships set out on a triangular voyage, carrying manufactured goods to Africa to trade for slaves, carrying slaves to the West Indies to sell for sugar, and carrying the sugar they returned home. The father of Mrs. Elton scarcely deserved the name of merchant because his profits from ordinary mercantile ventures were “so very moderate.” But if his younger daughter inherited a fortune of £10,000, he must have died wealthy. Therefore his business as a merchant must be set “another line of trade” whose dignity was moderate but whose profits were not. This, I suggest, was the slave trade. Also, the family name of Hawkins evokes the slave trade because Sir John Hawkins introduced the slave trade to Britain. For Jane Austen’s contemporary readers, both the name of Miss Hawkins and her place of origin would have indicated her connection with the slave trade. The Beltman Archive BBC Hulton. 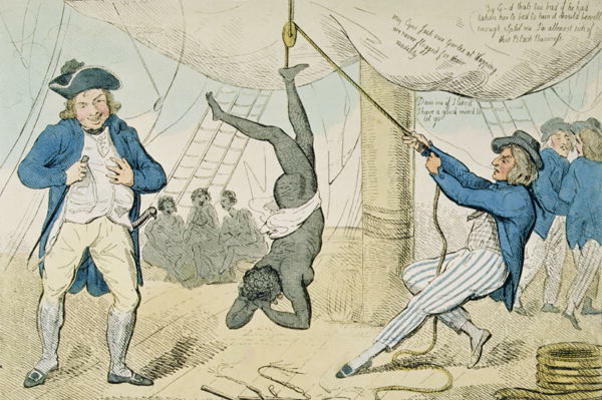 Mrs. Elton’s rejoinder makes sense only if Mr. Suckling was so intimately connected to the slave trade that its mere mention would bring his name to mind. Mrs. Elton would hardly have defended him unless there was a reason to suspect that he was not a friend of the abolition. 1 James A. Rawley, The Transatlantic Slave Trade. A History (New York, 1981), 184. I would like to thank Margaret Hurley, Dwight Lindley, and Edwin Barrett for their helpful comments as I was writing this paper. I am grateful to the Bettman Archive for procuring the picture from the BBC Hulton Picture Library. 2 Letter written to Cassandra, January 24, 1813, known to me from Jane Aiken Hodge, The Double Life of Jane Austen (London, 1972), p. 133. Letters, p. 292. 3 The remarks of Emma (Chapter 22) and of Mr. Knightley (Chapter 38) make it clear that Mrs. Elton’s superiority was determined merely by her fortune.